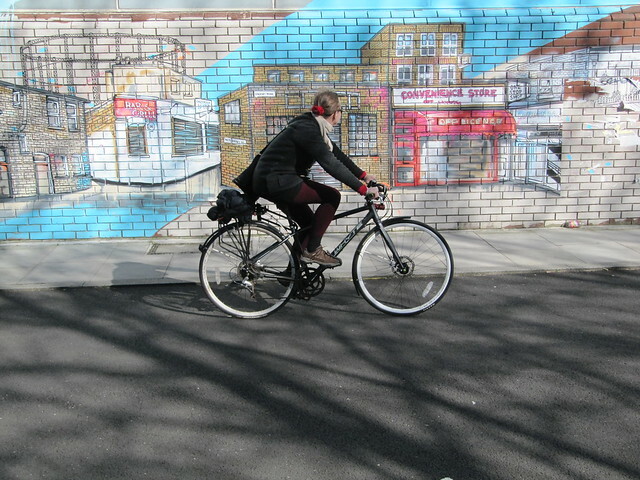 Here at ibikelondon we've got a bit of a thing about walls in Hackney (weird, I know). 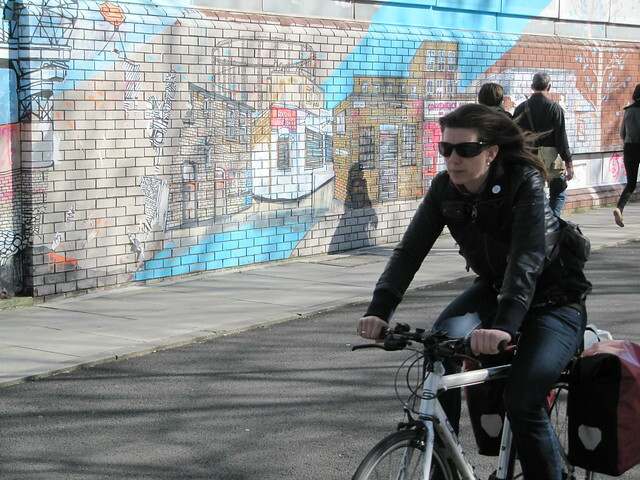 One of our favourite photography haunts is a little spot on Cat and Mutton bridge we like to call the cycle chic wall, where we've been taking pictures of emerging bicycle culture for years now. 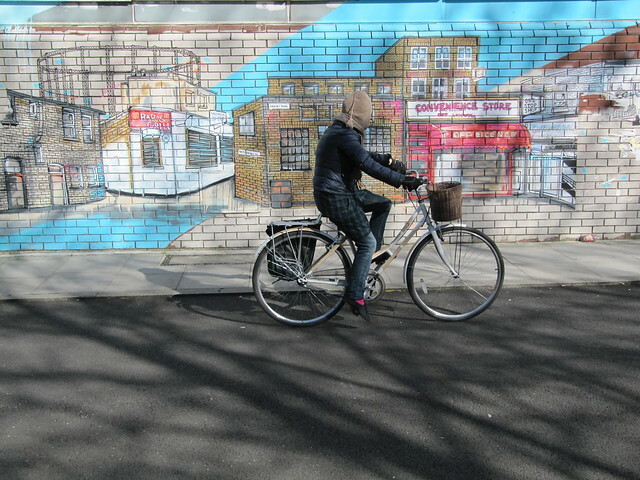 But now there's a new kid on the block to challenge for the crown of most photogenic mortar in the biking borough. 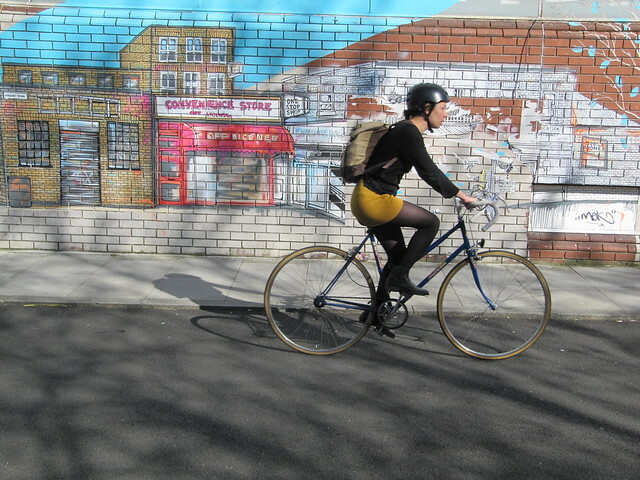 Someone has painted an incredible mural of a local street on to the walls of the disused hospital that borders Goldsmith's Row, Hackney's unique walking-and-cycling-only road that we've featured here before. 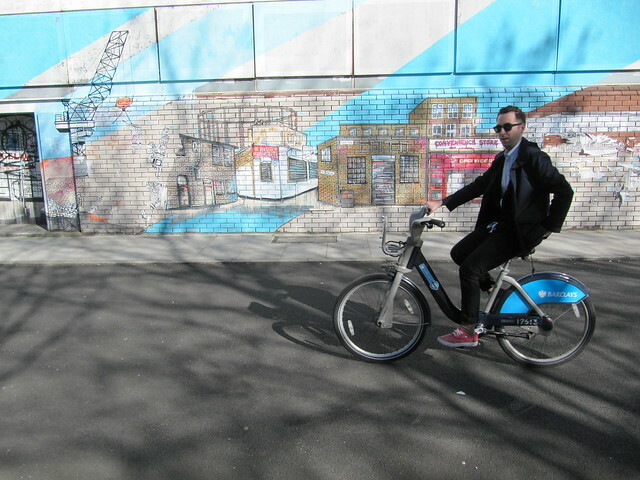 The mural added a shock of blue to a recent day of golden light and long shadows, and helped to form the perfect backdrop for showing off some of London's most stylish (by which of course we mean everyday and ordinary) cyclists. 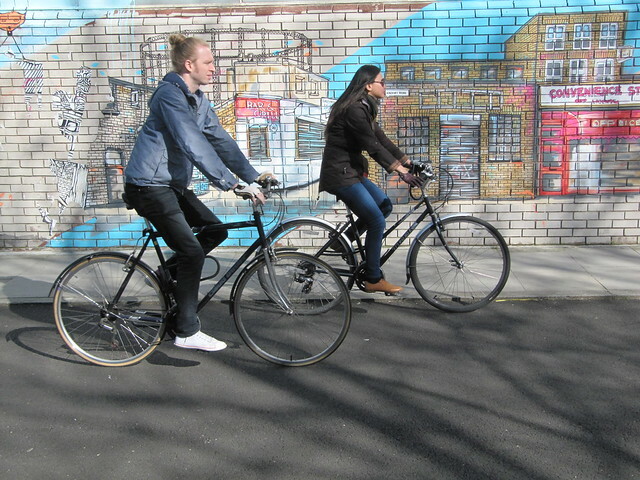 By and large the mural seemed to be attracting all of the attention, although one passing Boris Biker seemed a bit perplexed as to why I was taking pictures of bricks. Maybe he had a point. Either way, I love how a spot of paint and some creative juices have helped to transform a little corner of where I live, the big question being what will appear here next? One thing is for certain; the bikes will roll on. 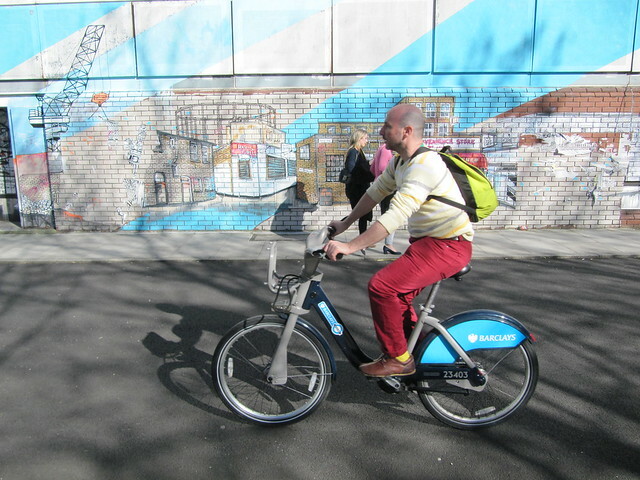 I love this mural - in fact this bit of road is now one of my favourite places to cycle, what with the car free smooth surface & the great mural and Hackney City Farm - what else do you need?! We need Hackney council to realise that people want more of this Dutch-style infrastructure (which is what it is), rather than battling with trucks and buses on the main roads like they expect everyone to do on the newly "improved" Kingsland High Street. @Kerene I love this mural too! I thought it really brightened up an otherwise drab bit of wall. I know exactly how you feel when you ride here, too. That "Aaaaand relax.." feeling when you're away from motorised traffic is so nice. @DFT Sadly you are right; there has been too much focus on "filtered permeability" on the quieter streets of Hackney, whilst the main roads go ignored. You only need to stand on the Hackney Road at rush hour to see how many people use the most direct (busiest) routes to get from A to B, and how much those large busy roads really need some proper cycling infrastructure. Sadly, there is an ideological stand point in the Hackney LCC group which is vehemently anti-cycle lane, and pro-filtered permeability to the detriment of all other interventions, when of course what we need is a bit of everything! I know purposefully cycle down here each morning on my way to work, even though it takes me out of my direct route, simply as it's just such a lovely place to cycle!! It's great now there are no cars...i drive clover the donkey down here in her cart...turning left at the mural into the park....a special piece of London. Chris I thought I was halucinating when I saw a donkey down there before. Thanks for letting me know I wasn't going bonkers! Amazing, who knew cycling infrastructure can even be good for donkeys? I've heard it all now! It's fantastic to see that this road is so popular with the cyclists who use it. Bravo, Hackney, more of the same please!